Rather than splurge over the odds for a distressingly pricey hotel room, we can now make ourselves at home - in someone else's home - all over the world. However, there are still some countries that offer better value for money than others. Iceland, Sweden and Andorra officially top the tables, but there are some surprise bargains and overpriced anomalies dotted throughout - especially if you're searching for group getaways or a romantic escape. 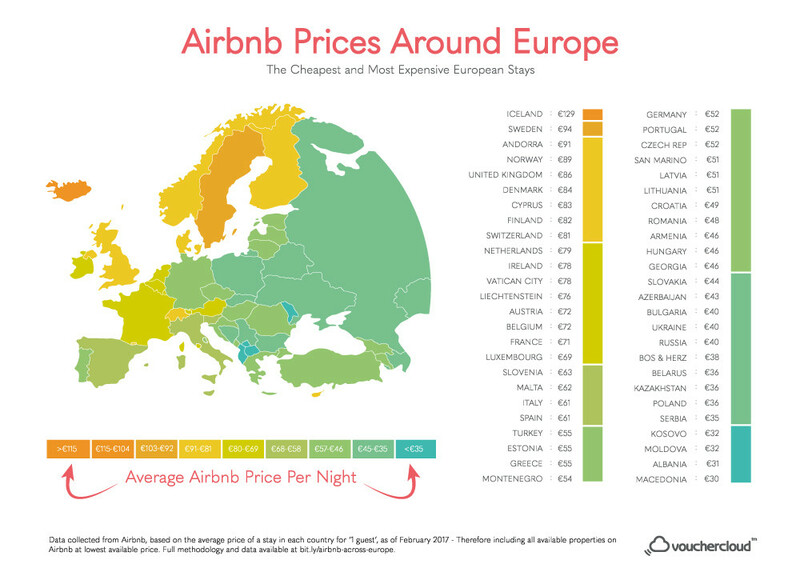 Take a look at our map and chart to discover more about Airbnb prices around Europe and see where you could save - and with prices ranging from £112 per night to £26 on average, there's plenty of wiggle-room! (Versions of the map and the chart in Euros are also available - full research can be found via this link). Iceland (£112), Sweden (£82) and Andorra (£79) officially top the list of most expensive Airbnb nations, followed closely by Norway (£77) and the UK (£75). 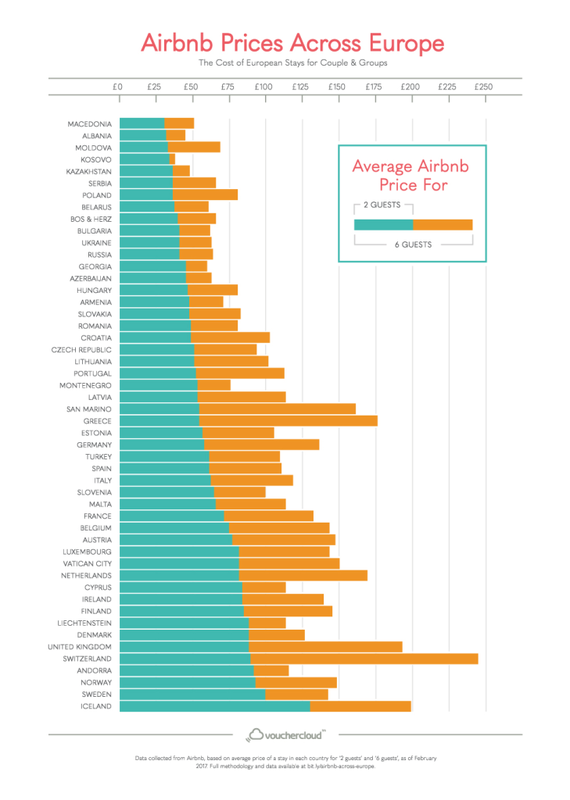 The average price per night of an Airbnb across Macedonia (£26), Albania (£27) and Moldova (£28) represent the cheapest offerings across Europe. On-the-rise areas like Poland (£31) and Croatia (£43) also offer surprisingly cheap stays, while Germany (£45) and Portugal (£45) represent the surprise bargains among more popular holiday destinations. The data has also highlighted the biggest bargains - and most extravagant escapes - if you’re specifically travelling in a couple or as a larger group (6 people); in fact, Greece, Switzerland and Germany make for the best value as a couple, while Andorra, Liechtenstein and Georgia are ideal group-getaway options on a budget. It’s likely no surprise to hear that there are capital cities where Airbnb travellers might struggle to get value for money too. In fact, Amsterdam, Rome, Moscow and Lisbon are the most overpriced capital cities compared to stays across the rest of the country, with Ankara, Podgorica, Nicosia and surprisingly Helsinki making for the most cut-price capitals. The data also referenced some other countries from around the world for some global context - US prices are second overall at £92, with Australia (£85) close behind. Canada (£65) and Japan (£55) sit nicely in the mid-table, while China (£43) is unsurprisingly on-budget. Data was collected from the Airbnb website across February 2017, taking the average price of an Airbnb rental in each country for 1, 2 and 6 guests (with ‘one guest’ representing every available property in that country). This data ignored peak prices, price fluctuations based on the date and season of booking and general availability - so actual prices may vary. You can also discover whether an airbnb or a hotel is cheaper in your dream destination, thanks to our guide to airbnb vs hotel prices in Europe, or find out just how much booking in advance pays off with our research into how hotel prices change over time. So we've tackled the most expensive capital cities, the cheapest and most expensive group getaways, and every country in Europe's Airbnb prices. We'd hate for you to have to filter through all that data, though - so we've gone into a little more detail to help you pick out a couple of bargains, and know what to avoid if you're short of cash for a weekend break. The nordic nations are, inevitably, some of the most expensive. Iceland (£112) stands outright at the top of the table, but Sweden (£82), Norway (£77) and Denmark (£73) are close behind. Finland (£71) actually makes for the most budget-friendly nordic nation, should you want to endeavour up north! On the other hand, Serbia (£30), Poland (£31), Croatia (£43) and Portugal (£45) are surprisingly budget options compared to the rest of Europe and could be worth keeping in mind. Even Germany (£45), Spain (£53) and Italy (£53) offer intriguing alternatives to some of the massively expensive Eurpean destinations, with even France (£63) and the UK (£75) adding a significant premium. Lisbon, Amsterdam, Rome and London are some of the cities where prices are significantly more expensive than the rest of the country, meaning it might be best to go a little more off-the-beaten-path if you want to see the sights and save some money. The likes of Vienna, Brussels and Athens come in under the average prices on the other end of the scale, alongside Bucharest and, surprisingly Helsinki. This offers up some interesting alternatives to the normal trips, but also offers an insight into the capital cities that might have a competitive Airbnb scene - or are simply pushing prices that are a little easier on the eye. Cyprus, Sweden, Denmark, Georgia and Bulgaria are some of the countries where travelling as a larger group is significantly cheaper than travelling as a couple - with the price per person almost half of what it would be if you were shopping as a couple across these countries. At the other end of the scale, it's somehow actually cheaper in Greece - per person - to get an Airbnb as a couple rather than as a group. Switzerland, Poland, the UK and Portugal aren't quite as big of a bargain as Greece when it comes to couple-friendly Airbnbs, but they're still on the cheap end of the scale. It’s safe to say that the days of fly by the seat of your pants rock bottom budget travel are almost numbered – between increases in fuel prices, taxes & levy’s and additional charges coming in left right and centre when you’re booking your well-deserved break – it’s hard to find something that ticks all the boxes and still comes out as an affordable option. 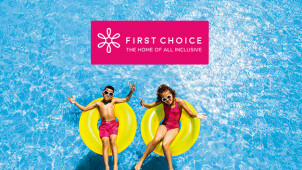 The good news is, regardless of your travel clan – solo, family, beach bum, city slicker, business, adrenaline seeker – you’ll find a huge range of money-saving travel vouchers here at vouchercloud like a TUI discount code to make your dream more affordable! Our offers cover almost every aspect of your travel planning and itinerary so you can rest assured you won’t be paying over the odds if you use a travel voucher. First things first, when it comes to transportation, we’ve got a wealth of offers you can use. Get discounts on parking and transfers with APH and other top brands at all the international airports you fly out of the most including Gatwick, Heathrow and Liverpool John Lennon. Not just the first leg of your journey, we’ll get you from A to B on the cheap too whether its trains, planes, automobiles or even ships that will see you reach your chosen destination.